Could Okinawa Influence Abe’s New Cabinet? Protests and an anti-base governor could distract from Abe’s core policies this fall. 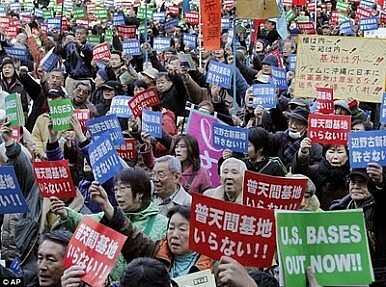 Protests on the Japanese island of Okinawa are again underway as the government and the U.S. military continue plans to transfer the Futenma Air Station (which is situated in a residential area) to the more remote location of Henoko, in Nago. The new U.S. Marine base is currently being cordoned off with buoys by the Japanese Coast Guard under orders by the ministry of defense. It appears that the government is seeking to preclude protests on the scale of 2004, which derailed the new facility’s drilling survey. The Japan Times reported that early on Thursday morning the Coast Guard began cordoning off large stretches of shoreline with buoys near the replacement facility. This move is largely being done to preempt protesters from disrupting drilling surveys before the work of land reclamation can begin. Despite the government’s attempts, about 20 protesters in canoes arrived and attempted to disrupt the process. However, the Coast Guard vessels were able to keep them from disrupting the laying of buoys. Despite the government’s renewed attempts to move forward with the construction of the new base, it will face further struggles up ahead, the largest of which looks to be Okinawa’s gubernatorial election in November this year. A victory for an anti-base candidate could be another setback, yet the government has shown it is willing to go ahead with plans despite public protest. However, Prime Minister Shinzo Abe will not want to let this become a national issue again with so many of his other policies requiring public support, and so winning the election will be important. Should he choose to replace LDP Secretary-General Shigeru Ishiba in the scheduled Cabinet shake-up in early September, his replacement will face the immediate task of building popular support for an LDP candidate who is in favor of the move. No mean feat in a place so strongly opposed to the U.S. military’s presence.